The Molten Salt Reactor is my favourite reactor. It cannot melt down, it is already a liquid. The IFR is a great reactor, but it uses explosive sodium to prevent overheating. (Yet remember, it is designed so that the sodium never comes in contact with water, and the sodium gives it enormous advantages over very high-pressure-cooker water reactors). But the Molten Salt Reactor uses chemically stable liquid salts like fluoride. These salts do not explode if they come into contact with water. The main reason that I promote the Integral Fast Reactor first is that the R&D for this reactor is basically done. It’s ready for commercial testing and deployment. But the MSR is still back developing the prototype. It has not had a full prototype testing phase yet, not like the decades the IFR has had in the EBR2 prototype. It cannot “melt down”, it is already a liquid! 2. JFK touring the original MSR! 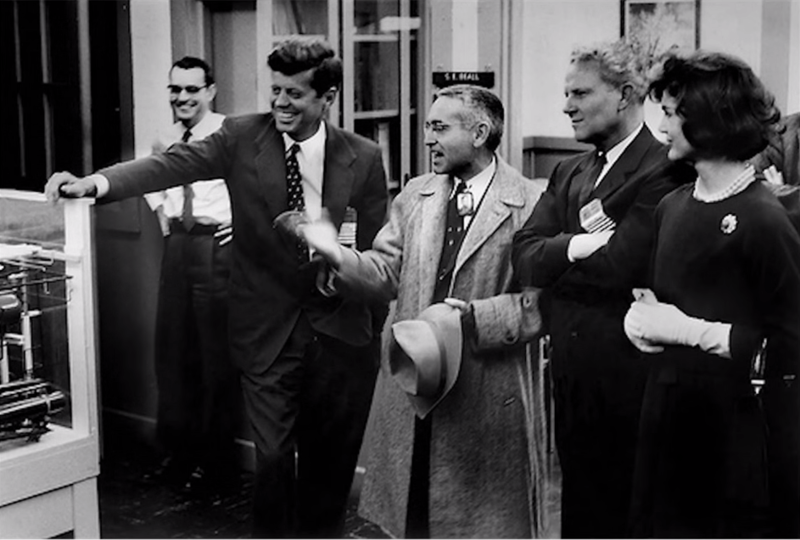 President JFK tours the Molten Salt Reactor prototype with nuclear engineer Alvin Weinberg on his right. MSR’s eat nuclear waste and warheads, just like the IFR. Liquid salt lets the fuel mix better, and means new fuel can be added to the reactor while waste products are extracted continually. Melt down is impossible: it is already a liquid! If the liquid fuel leaves the reactor core, it cannot fission. The reactor core uses graphite moderators to slow neutrons, essential to run a slow thermal reaction. No graphite moderator? No reaction! Even if someone shot an armour piercing bullet through the reactor, the liquid salt would drain out of the core and into the containment room and the liquid salt dries hard at 450 degrees C.
If the hole was not too wide, I wonder if the liquid salt might even dry as a plug? Most reactors need power to cool the reactor (like Fukushima). This needs power to work, the power holds the liquid fuel up in the reactor core, the only place it can fission. Imagine your kitchen sink full of absolutely boiling water. Instead of a plastic plug holding the water in, there’s a fan blowing freezing gas across the drainpipe under the sink. Only a thin block of ice holds the boiling water in the sink. The MSR is like that, except it’s hot salt instead of water. The power runs the fan blowing freezing gas across the pipe. It only has to get the salt under 450 degrees C, as at liquid fluoride salt hardens at 450C. If the power fails, the fan stops and the salt plug immediately melts under the immense heat from above. The fuel drains out of the reactor (the only place where it can fission) and gravity pulls it down into a drain tank designed to dump heat. In other words, melt down is impossible. Gravity never fails! There is a variety of Molten Salt Reactor promoted under another name, the LFTR (say “Lifter”) which stands for Liquid Fluoride Thorium Reactor. Here is an illustration of the drain tank. If someone dropped a bunker-buster missile on it and blew the reactor up, the thorium and uranium is chemically bonded to the liquid salt. Sure some fuel would be atomised and drift a kilometre or so, but most would dry at 450 degrees C and fall back to earth. It would remain more or less in the vicinity, and not blow across an entire continent as Chernobyl did. That’s the advantage of the fuel also being the coolant: the moment it fails, it drains away or hardens. The only place on earth this stuff can fission and stay hot is in the reactor core itself! Thorium is 4 times more abundant than uranium and every nation has their own supply. The Thorium decay path produces the wrong waste for bombs. 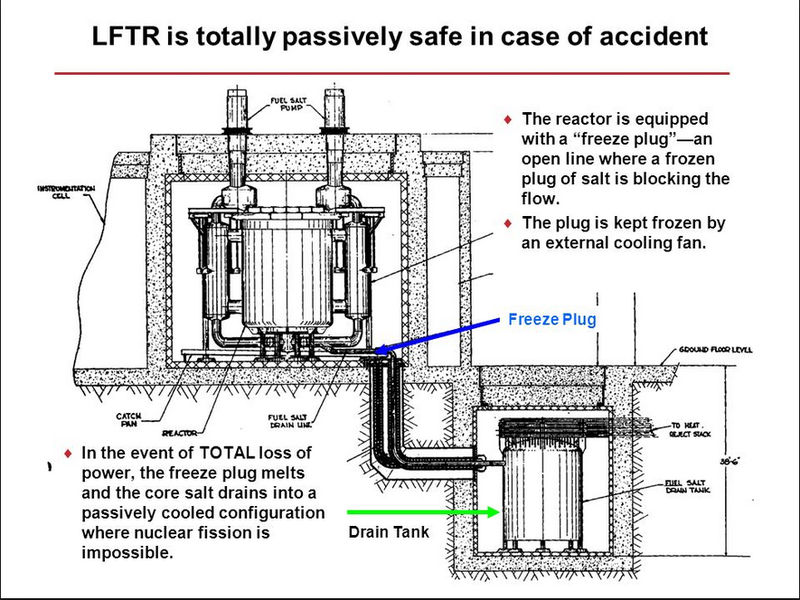 LFTR’s are too difficult for the Bomb, which is why they were overlooked as America’s choice of reactor during the Cold War! A small prototype worked way back in 1965, and if America had mass-produced thorium reactors they could have achieved energy independence and sustainability and security by 2000. It’s a crime that this 1960’s research was not followed up with industrial strength efforts to commercialise this technology. If that had happened, we would not even be talking about climate change right now! 4. China investing BIG in thorium! Full scale prototype in just 15 years.